At Frontier Basement Systems, we solve foundation settlement issues of all kinds! Call us for a free foundation settlement repair quote today! At Frontier Basement Systems, we recommend installing foundation piers to stabilize, repair, and restore a foundation that's been damaged by issues related to foundation settlement and poor supporting soils. Like all home improvements and repairs, some methods work better than others. On the other hand, some methods seem to hardly work at all. In fact, at Frontier Basement Systems, we find that many of our foundation repair jobs are actually just fixing the unsuccessful repairs of other contractors. A complete foundation replacement in Lebanon. The house is placed on temporary supports while the foundation is excavated and replaced. At Frontier Basement Systems, we address the problem with warrantied solutions that will fix your problem once and for all. We Repair Settling Foundations in TN and KY! At Frontier Basement Systems, we can identify and repair any issue you may be having with settling, sinking foundations. We have a wide variety of solutions for foundation repair that have been tested and proven effective throughout the United States and Canada through the Supportworks network of foundation contractors. 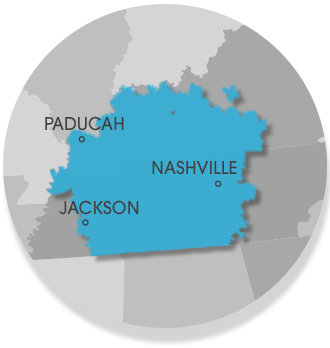 We proudly serve Nashville, Clarksville, Jackson, areas such as Bowling Green, Murfreesboro, Owensboro, Utica, Fayetteville, Marion, Philpot, and nearby.